Children in the age of up to 2 years are fee. Children in the age of 2 – 12 receive a 50% discount. The discount will be provided only under condition that the children will be accommodated in the same apartment as their parents. An advance payment in height of 20% of the total amount is required for a successful reservation. The payment of the outstanding amount has to be paid in cash at the beginning of your stay. (credit cards are not accepted). 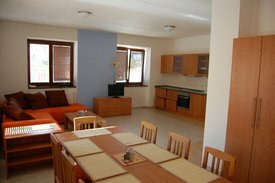 An one-time payment of 1000 Kč/stay (40€) will be required for any pet accommodated. For 250 K č (10€) you can book our sauna for 4 - 6 persons and warm up yourself. On request, we can offer you a selection of very good Moravian wines directly from the winemakers.